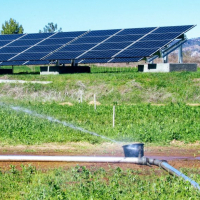 This 27KW solar pumping system we installed at Full Belly Farm is a solution for pumping in areas not connected to the grid. It generates electricity without emitting greenhouse gases or air pollution. 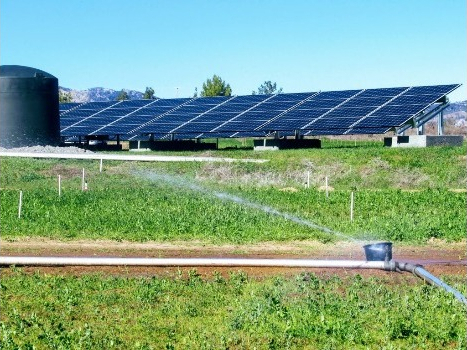 This system will power a 25 HP pump to an almond orchard on 12.5 acres. Look for solar powered almond butter from Full Belly Farm soon! We also worked with them to make their operations more energy efficient. All these retrofits will pay for themselves in energy savings and rebates, with money leftover to invest back into the business. Sustainable Technologies is a provider of energy efficiency retrofits and renewable energy installations that help you save money and are better for the environment. With over 20 years of expertise in environmental construction, electrical and plumbing, we can design an irrigation and energy system that meets your needs.